Some ransomware infections are more sophisticated than others, and Armage Ransomware cannot be viewed as a sophisticated threat. Once executed, it encrypts files and creates one single unique file that displays a few lines of text. This serves as the ransom note. Although the build of the infection is pretty simple and boring, it is a file encryptor nonetheless. That means that if it manages to invade your Windows operating system, it can corner you into following the demands set up by the creator. Unfortunately, some users might see no other option but to do this because they might want to restore their personal files. The bad news is that it is unlikely that files can be restored even if all demands are met. Even though the situation might be without a solution, there are things that you need to do if you face the malicious ransomware. Without a doubt, you need to remove Armage Ransomware. According to our research team, the main launcher of the ransomware should delete itself, but there are other components you might need to think about. Our research has extensive experience when it comes to ransomware. If you look at the most recent removal guides, you will find such names as Proticc Ransomware, Unlock92 Zipper Ransomware, Desu Ransomware, Cryptolite Ransomware, etc. All of these threats are unique, and they work in unique ways. For example, some can encrypt MBR to prevent the user from booting Windows, and others can lock the screen of the affected system and display an intimidating message that, allegedly, was sent by FBI or another reputable organization. Most file encryptors, however, are just as straightforward as Armage Ransomware. The first step for this malware is to enter the system, and it can do that using hidden files. These could be presented to users via spam emails or malicious downloaders. If the victim is tricked into executing the infection, it quickly encrypts files stored on the affected system. It should not encrypt system files, but photos, documents, videos, and similar files are likely to be affected. If they are, the “.armage” extension is appended to their names. You cannot restore the corrupted files by removing this Armage Ransomware extension. Everywhere where files are encrypted, a file named “Notice.txt” should be created. The text in the file reads: “Your files was encrypted using AES-256 algorithm. Write me to e-mail: armagedosevin@aol.com to get your decryption key.” If you email armagedosevin@aol.com, you will not get a decryptor. Instead, you will be asked to pay a ransom first, and that is something you should not do, even if the ransom appears to be small. This is not recommended because schemers are not known for keeping their promises or operating honest transactions. In fact, we do not even recommend emailing the creator of Armage Ransomware because you do not want a malicious party to record your email address. As discussed earlier, spam emails can be used to distribute malware, and so you want to avoid sharing your address with someone who has malicious intentions. After Armage Ransomware encrypts files and creates the ransom notes, it should delete itself, which, if you look on the bright side, can make the removal easier. You have to delete Armage Ransomware from your operating system as soon as possible. There should be no debate about that. Hopefully, the launcher is removed automatically after the attack is complete, but you want to make sure that is the case. Since it can be hard or even impossible to find malware manually, it is the smart thing to do to implement an anti-malware program. If there are any malicious components, they will be eliminated automatically. Anti-malware software can also ensure that malware cannot just enter your operating system, and that is exceptionally important because the last thing you want to deal with is yet another infection. If you have questions about the removal of Armage Ransomware for our research team, you can communicate with us using the comments section. It is open to anyone who wants to discuss the threat further. One last piece of advice: Back up your files! If they are backed up, you do not need to worry about getting files encrypted or losing them in other ways. 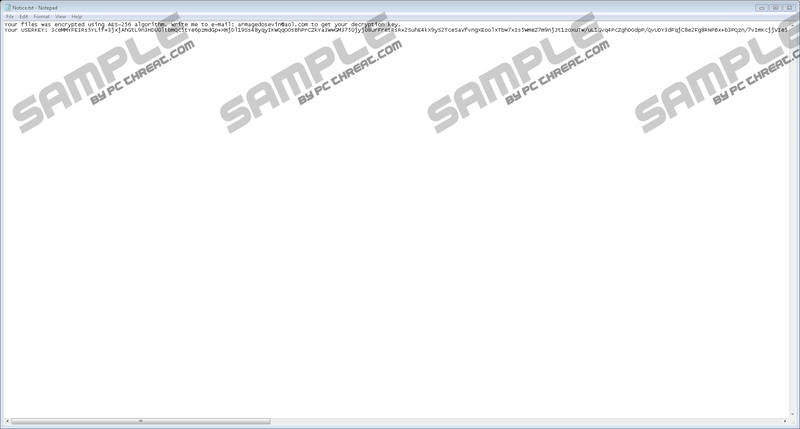 Look for the launcher of the ransomware. It should delete itself after execution, but you want to double-check that it does not exist. Delete all copies of the ransom note file, Notice.txt. After you think all malicious components are erased, Empty Recycle Bin. Install and run a legitimate malware scanner to check if your operating system is indeed clean. Quick & tested solution for Armage Ransomware removal.